Staying at our Bethlehem PA bed and breakfast provides you with the opportunity to explore the charming town around you. Sayre Mansion is a wonderful place to stay during your trip and is conveniently located so you’ll always have things to do in Bethlehem PA. From historical sites to outdoor fun, Bethlehem has something for everyone.To help you plan your activities, we’ve made a list of things to do in Bethlehem, PA during your stay. Located in the 1741 Gemeinhaus, the Moravian Museum of Bethlehem takes visitors through the history of the Moravian founders of Bethlehem. The Gemeinhaus is now a National Historic Landmark. The Moravian people came from Moravia, an historic country in Central Europe in an area that is the current day Czech Republic. Learn about Bethlehem’s Moravian ancestors including stories about missionary work, medicine, communal living and progressive education. 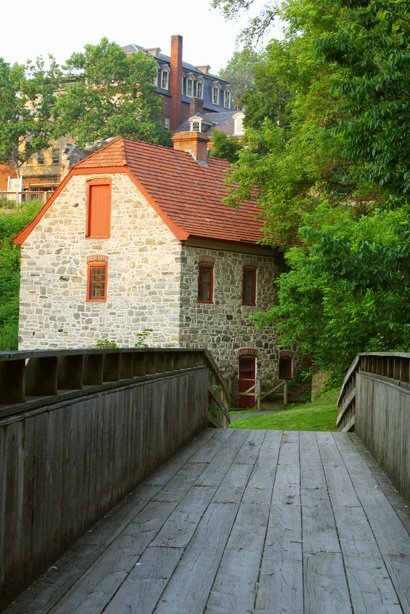 For those curious about the town’s background, a visit to the Moravian Museum should be at the top of your list of things to do in Bethlehem PA.
An important part of the Moravian farming system, the James Burnside homestead is in a lovely park on the Monocacy Creek. The site has 18th and 19th century farmhouse, a summer kitchen, two barns and a garden. Burnside Plantation is also home to on of the only high horse powered wheels in the US. A staple in Bethlehem since 1898, the Bach Choir of Bethlehem promotes the spiritual nature of Johann Sebastian Bach. The choir performs year round and provides education on Bach and those he influenced. For concert schedules and ticketing click here. Visit the “Niagra of Pennsylvania.” Bushkill Falls is one of Pennsylvania’s most famous scenic attractions. Hike the trails through the woods in the park to the falls. Various bridges provide opportunities to see the falls and forest from different points. Currently closed for the winter, the park reopens in April. The Banana Factory is an arts & education center that is just right for the creative person looking for things to do in Bethlehem PA. The Banana Factory offers courses in various artistic endeavors and fantastic exhibitions. For class schedules and more information on exhibits, click here. Raft the famous Lehigh River Gorge in the Pocono Mountains. Enjoy the beauty of the wilderness around you as you take on exhilarating rapids down the river. No experience is necessary to enjoy this excursion. Take your explorations underground at Lost River Caverns. Tours of the caverns last 30-45 minutes and utilize well-lit paved paths. Several notable crystal formations can be observed in the caverns, which maintain a constant temperature 52 degrees fahrenheit. There is also a museum, gem mill and nature trail. When filling up your schedule with things to do in Bethlehem PA, staying at a Bethlehem bed and breakfast is the perfect way to make sure your visit is special and memorable. Sayre Mansion has several rooms and suites to choose from. Each is stylishly appointed in a style that blends old world elegance with modern convenience. Your stay includes a hearty breakfast each morning and personal attention from the Sayre Mansion staff. Find your perfect room today!